The anteater is one of those species of animals named after what it does, like the sidewinder, the walking horse and the boomslang (although it has been many years since anyone has actually seen ANY snake slang a boom). The anteater, of the order Pilosa, has been around for millions of years; and, the fatigue is beginning to show. They are most closely related to the sloth, although they seldom return its phone calls. The anteater’s habitat is Central and South America. The earliest ancestors of the anteater came from North America, possibly during the Pleistocene era and possibly while high. Scientists theorize that they migrated south for a concert and, due to oversleeping, missed the bus the next day. 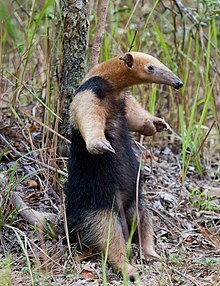 The anteater tends to live near waterways and deep in the rain forest; this is good considering the only other choices of habitat in Central and South America would be the peaks of the Andes and downtown Bogota. Anteaters have no teeth, which means that you seldom see one smiling. Even if one does smile, it tends to be a lop-sided RAF fighter pilot grin. They have a long snout which, unlike that of the Tapir, is tapered. 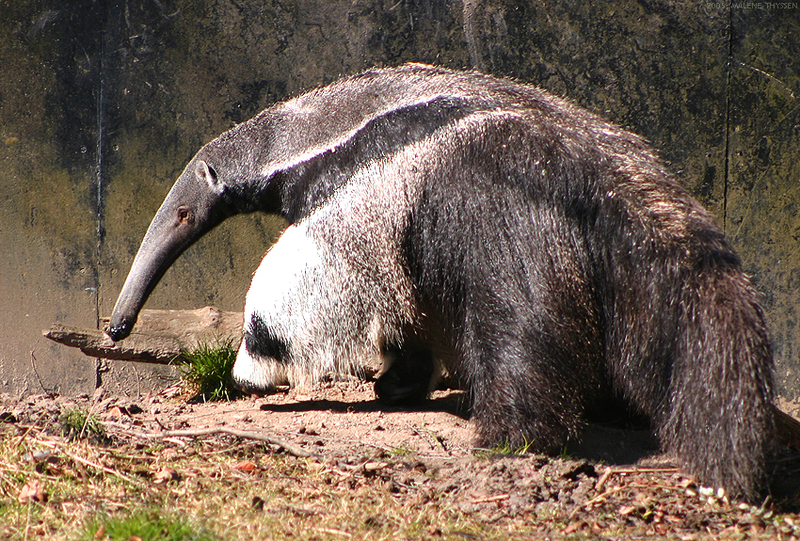 The anteater has sharp claws which it uses to tear into insect mounds, climb trees and defend itself from drunken zoo-goers. The tongue of the anteater can extend up to twenty-four inches, even more if it is detached surgically. It’s tail is nearly the same length as its body. All in all, it is very thin on one end, much wider in the middle, then very thin on the other end. Like a hairy brontosaurus. Anteaters are ferocious fighters and have even killed humans from time to time. Their claws can tear open an enemy’s abdomen faster than you can say, “Jack Robinson”; in fact, it is probably safer to say, “Jack Robinson” than to stand too close to an anteater. They only attack when threatened; but, who’s to say what constitutes a threat? You? Don’t make me laugh. There are four species of anteater: Giant Anteater, Silky Anteater, Northern Tamandua and Southern Tamandua. The giant anteater is the species that looks most like a bear and least like mollusk. It can be seven feet long from its snout to the tip of its tail–even longer if measured in centimeters. Like fictional character Freddy Krueger, the giant anteater has razor sharp claws and has been known to attack people in their dreams. Also like Freddy Krueger, the giant anteater can weigh up to one hundred and forty pounds. Because its eyes are set on the side the giant anteater must rely upon contact lenses for its vision correcting needs. The giant anteater does not use hydrochloric acid to digest its food, so it that is a deal-breaker for you I’d find another animal. Rather it uses its prey’s formic acid to help digest its food. Also, there is some speculation that the giant anteater might use small rocks to grind the ants and termites that it swallows. The giant anteater can eat up to thirty thousand ants in a day–more if it has access to a blender or food processor. The silky anteater is about a foot long and weighs less than a pound. It can eat up to eight thousand ants in a single day and will remember that day for the rest of its life. Its predators mostly attack from the sky. They include eagles, hawks and very ambitious wrens. 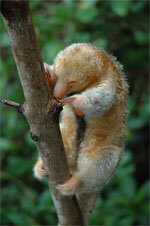 The silky anteater was probably named for the silk cotton trees in which it tends to reside. Well, with a suave British accent I would hang out with one all day! Unless it hissed at me – then I guess I would check out my tires too and curse the thing 🙂 Fun to read!